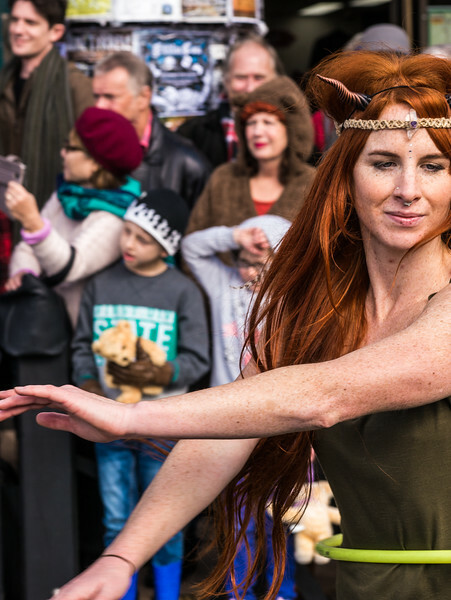 The wonderful thing about Winter Magic in Katoomba was the parade. You have people dressed up and the streets were filled with people. Great for street photographer like myself. Every seconds there were something interesting to photograph. I was putting on my camera on burst to get all the actions. I was using two cameras, one for the portrait and the other was for wide angle environmental portraits. This shot was using a portrait lens, hence the weird cropped. It was a fixed focal length at 60mm Micro Fourth Third or 120mm in Full Frame equivalent. One of my favourite focal length for portraiture. The 70-200mm f2.8 would be nice on my next lens wish list.